Twitter's origins lie in a "daylong brainstorming session" held by board members of the podcasting company Odeo. Dorsey introduced the idea of an individual using an SMS service to communicate with a small group. The original project code name for the service was twttr, an idea that Williams later ascribed to Noah Glass, inspired by Flickr and the five-character length of American SMS short codes. The developers initially considered "10958" as a short code, but later changed it to "40404" for "ease of use and memorability." 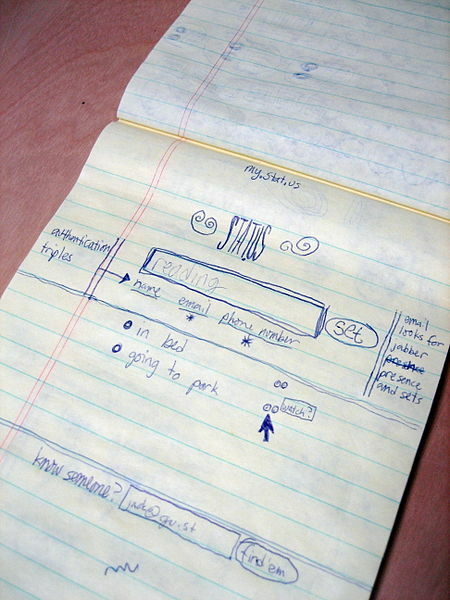 Work on the project started on March 21, 2006, when Dorsey published the first Twitter message at 9:50 PM Pacific Standard Time (PST): "just setting up my twttr". The first Twitter prototype was used as an internal service for Odeo employees and the full version was introduced publicly on July 15, 2006. In October 2006, Biz Stone, Evan Williams, Dorsey, and other members of Odeo formed Obvious Corporation and acquired Odeo and all of its assets–including Odeo.com and Twitter.com–from the investors and shareholders. Williams fired Glass who was silent about his part in Twitter's startup until 2011. Twitter spun off into its own company in April 2007. The tipping point for Twitter's popularity was the 2007 South by Southwest (SXSW) festival. During the event, Twitter usage increased from 20,000 tweets per day to 60,000. "The Twitter people cleverly placed two 60-inch plasma screens in the conference hallways, exclusively streaming Twitter messages," remarked Newsweek's Steven Levy. "Hundreds of conference-goers kept tabs on each other via constant twitters. Panelists and speakers mentioned the service, and the bloggers in attendance touted it." On September 14, 2010, Twitter launched a redesigned site including a new logo. Twitter's usage spikes during prominent events. For example, a record was set during the 2010 FIFA World Cup when fans wrote 2,940 tweets per second in the thirty-second period after Japan scored against Cameroon on June 14, 2010. The record was broken again when 3,085 tweets per second were posted after the Los Angeles Lakers' victory in the 2010 NBA Finals on June 17, 2010, and then again at the close of Japan's victory over Denmark in the World Cup when users published 3,283 tweets per second. The current record was set during the 2011 FIFA Women's World Cup Final between Japan and the United States, when 7,196 tweets per second were published. When American singer Michael Jackson died on June 25, 2009, Twitter servers crashed after users were updating their status to include the words "Michael Jackson" at a rate of 100,000 tweets per hour. From September through October 2010, the company began rolling out "New Twitter", an entirely revamped edition of twitter.com. Changes included the ability to see pictures and videos without leaving Twitter itself by clicking on individual tweets which contain links to images and clips from a variety of supported websites including YouTube, Flickr, as well as a complete overhaul of the interface, which shifted links such as '@mentions' and 'Retweets' above the Twitter stream, while 'Messages' and 'Log Out' became accessible via a black bar at the very top of twitter.com. As of November 1, 2010, the company confirmed that the "New Twitter experience" had been rolled out to all users. On April 5, 2011, Twitter tested a new homepage, as well as phased out the "Old Twitter." However, a glitch came about after the page was launched, so the previous "retro" homepage was still in use until the issues were resolved; the new homepage was reintroduced on April 20. On December 8, 2011, Twitter overhauled its website once more to feature the "Fly" design, which the service says is easier for new users to follow and promotes advertising. In addition to the Home button, the Connect and Discover buttons were introduced along with a redesigned profile and timeline of Tweets. The site's layout has been compared to that of Facebook. Tweets are publicly visible by default; however, senders can restrict message delivery to just their followers. Users can tweet via the Twitter website, compatible external applications (such as for smartphones), or by Short Message Service (SMS) available in certain countries. While the service is free, accessing it through SMS may incur phone service provider fees. In June 2008, Twitter launched a verification program, allowing celebrities to get their accounts verified. Originally intended to help users verify which celebrity accounts were created by the celebrities themselves (and therefore are not fake), they have since been used to verify accounts of businesses and accounts for public figures who may not actually tweet but still wish to maintain control over the account that bears their name - for example, the Dalai Lama. Verified accounts can be identified by a white check in a blue background, known as a verification badge, next to the user's full name, on the profile itself or next to the name in search results. The messages were initially set to 140-character limit for compatibility with SMS messaging, introducing the shorthand notation and slang commonly used in SMS messages. The 140-character limit has also increased the usage of URL shortening services such as bit.ly, goo.gl, and tr.im, and content-hosting services, such as Twitpic, memozu.com and NotePub to accommodate multimedia content and text longer than 140 characters. Twitter uses its own t.co domain for automatic shortening of all URLs posted on its website. Twitter is ranked as one of the ten-most-visited websites worldwide by Alexa's web traffic analysis. Daily user estimates vary as the company does not publish statistics on active accounts. A February 2009 Compete.com blog entry ranked Twitter as the third most used social network based on their count of 6 million unique monthly visitors and 55 million monthly visits. In March 2009, a Nielsen.com blog ranked Twitter as the fastest-growing website in the Member Communities category for February 2009. Twitter had annual growth of 1,382 percent, increasing from 475,000 unique visitors in February 2008 to 7 million in February 2009. It was followed by Zimbio with a 240 percent increase, and Facebook with a 228 percent increase. Twitter has a user retention rate of forty percent. There are numerous tools for adding content, monitoring content and conversations including Twitvid (video sharing), Tweetdeck, Salesforce.com, HootSuite, and Twitterfeed. Less than half of tweets are posted using the web user interface with most users using third-party applications (based on analysis of 500 million tweets by Sysomos). Twitter's 30 March 2010 blog post announced that the hottest Twitter trending topics will scroll across the Twitter homepage. Users will also be able to find out why a specific topic got to be a trending topic. There have been controversy surrounding the Twitter trending topics: Twitter censored hashtags that their users found offensive. Twitter censored the #Thatsafrican and the #thingsdarkiessay[dead link] hashtags after users complained that they found the hashtags offensive. On April 13, 2010, Twitter announced plans to offer paid advertising for companies that would be able to purchase "promoted tweets" to appear in selective search results on the Twitter website, similar to Google Adwords' advertising model. As of April 13, Twitter announced it had already signed up a number of companies wishing to advertise including Sony Pictures, Red Bull, Best Buy, and Starbucks. As of April 6, 2011, Twitter engineers confirmed they had switched away from their Ruby on Rails search-stack, to a Java server they call Blender. From the spring of 2007 until 2008 the messages were handled by a Ruby persistent queue server called Starling, but since 2009 implementation has been gradually replaced with software written in Scala. The service's application programming interface (API) allows other web services and applications to integrate with Twitter. June–July 2010 – Twitter has a very high service rejection rate (10%-20%) during 2010 FIFA World Cup period, also, the response latency increased a lot. In May 2011, a claimant known as "CTB" (subsequently identified as Ryan Giggs) in the case of CTB v Twitter Inc., Persons Unknown took legal action at the High Court of Justice in London against Twitter., requesting that Twitter release details of account holders. This followed gossip posted on Twitter about Giggs' private life, causing conflict relating to privacy injunctions. Tony Wang, the head of Twitter in Europe, said that people who do "bad things" on the site would need to defend themselves under the laws of their own jurisdiction in the event of controversy, and that the site would hand over information about users to the authorities when it was legally required to do so. He also suggested that Twitter would accede to a UK court order to divulge names of users responsible for "illegal activity" on the site. t.co is a URL shortening service created by Twitter. It is only available for links posted to Twitter and not available for general use. Eventually all links posted to Twitter will use a t.co wrapper. Twitter hopes that the service will be able to protect users from malicious sites, and will use it to track clicks on links within tweets. The traditional centralized client-server architecture has not scaled with user demand, leading to server overload and significant loss of availability. There is some decentralized architecture to enhance the scalability of Twitter including Fethr and Cuckoo. Fethr adopts a fully decentralized scheme, which connects micropublishers in a single global network. Users contact each other directly via HTTP, and gossip is utilized for data delivery among the subscribers. Cuckoo utilizes a peer-assisted architecture to offload the processing and bandwidth costs from the server site. Cuckoo classifies the microblogging users into two categories, i.e., social network users and news media users. For a social network user who has few followers, it delivers its new tweets directly to its followers in a unicast fashion. For a new media user who has a significant number of followers, it utilizes gossip for tweets delivery, i.e., enabling its follows to share new tweets with each other. At the same time, server cloud is kept for ensuring the high data availability and data consistency. Twitter has been used for a variety of purposes in many different industries and scenarios. For example, it has been used to organize protests, sometimes referred to as "Twitter Revolutions" and which include the 2011 Egyptian revolution, 2010–2011 Tunisian protests, 2009–2010 Iranian election protests, and 2009 Moldova civil unrest. The governments of Iran and Egypt blocked the service in retaliation. The service is also used as a form of civil disobedience: in 2010, users expressed outrage over the Twitter Joke Trial by making obvious jokes about terrorism; and in the British privacy injunction debate in the same country a year later, where several celebrities that had taken out anonymised injunctions, most notably the Manchester United player Ryan Giggs, were identified by thousands of users in protest to traditional journalism being censored. 0 Komentar untuk "History Of Twiter"